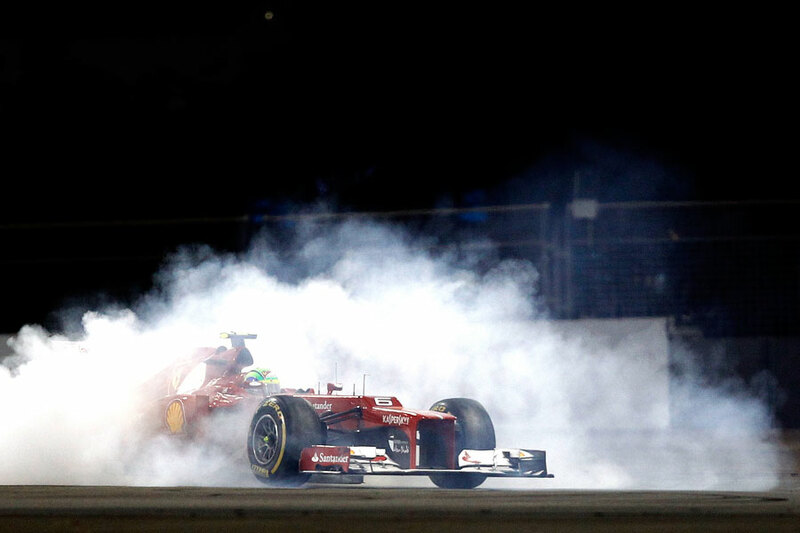 Kimi Raikkonen won a dramatic Abu Dhabi Grand Prix from Fernando Alonso as safety car periods helped Sebastian Vettel to third place in what might prove to be a pivotal evening in the championship. Raikkonen inherited the lead early on when Lewis Hamilton retired and then managed to withstand late pressure from Alonso to take his first win of his return to Formula One this season. A late safety car period - caused by a collision between Sergio Perez, Romain Grosjean and Mark Webber which saw the latter two retire - came just after Vettel had pitted for a new set of soft tyres and he passed Jenson Button in the closing laps to secure a remarkable podium having started from the pit lane. The result means Alonso has closed the gap to Vettel to 10 points in the championship, offering Ferrari a potential lifeline despite a hugely impressive performance from Red Bull to get its man on the podium. Raikkonen got a good getaway at the start of the race and jumped to second behind Hamilton into turn one. Webber slipped to fourth behind Maldonado and soon came under attack from Alonso, who found a way past and soon started troubling the Williams. In Vettel's haste to make up positions from the pit lane he lost his front wing endplate against Bruno Senna in the opening laps at the turns eight/nine chicane. The team decided to keep him out regardless, but when a safety car was deployed following a huge accident between Nico Rosberg and Narain Karthikeyan the situation changed. Rosberg had been recovering from an early pit stop due to first lap contact and came across Karthikeyan's slowing HRT in the high-speed turn 15. The Mercedes driver had no time to react and launched his car over the back of Kathikeyan and into the distant Tec-pro barrier. Both drivers climbed out of their cockpits uninjured, but the field bunched up as the marshals started a lengthily clean-up operation. Behind the safety car, Vettel finished his front wing off when he had to swerve to avoid Daniel Ricciardo warming up his brakes and he clouted the DRS activation marker board on the back straight. With carbon fibre flapping at the front of his car, Vettel was called into the pits and came back out at the back of the pack. At the restart, Hamilton resumed his lead but five laps later his car ground to a halt with a fuel pressure problem. He had looked locked on for the victory and the problem was a cruel blow with Hamilton coming to the end of his final season with McLaren in two races time. But for Lotus it was a golden opportunity and Raikkonen snatched it by taking the lead and controlling the pace for the rest of the race. Behind him Alonso took advantage of a mistake from Maldonado and took second place as Webber also started to pile on the pressure on the Williams. Webber tried a move soon after but clipped the Williams as he passed and tipped himself into a spin. Button then showed how it should be done at turn 11 and made the move stick to take third place as Webber dropped to seventh. Vettel, meanwhile, had made his way into the top ten and when he came up behind the recovering Webber, the No.2 Red Bull was ordered to pit. That ruined Webber's race and released him back onto the track behind an intense battle between Romain Grosjean, Sergio Perez and Paul di Resta. The trio of younger drivers bunched up closer and closer and eventually came to somewhat inevitable blows on lap 38. Di Resta pulled a legitimate and clean passing move on Grosjean into turn 11, but was followed by Perez who then tried to pass the Force India in turns 12 and 13. The move didn't work and di Resta was forced across the kerb at turn 13 while Perez ran wide. The Force India just about got away unscathed, but as the Sauber came back onto the track he cut across Grosjean who had nowhere to go. Webber was keeping a watching brief but couldn't avoid Grosjean and joined the accident. Perez was the only one of the three to continue but the stewards took a dim view of his behaviour and gave him a 10-second stop/go penalty as a safety car came out to clear the debris. By that point Vettel was up to fourth and had just made a second pit stop, allowing him to close on Button under the safety car. He was on fresher and softer tyres and after a number of attempts judged his move perfectly to complete his fantastic drive from the pit lane to the podium. Alonso pressured Raikkonen in the closing stages but was never close enough to activate his DRS. It was a fantastic driver by all three of the podium finishers, who remain in reverse order at the top of the title standings. Whether Alonso can beat Vettel to the top spot by the end of the season will be decided at the next two races in the USA and Brazil.